When the new kid joins his class, Woodrow agrees with his schoolmates--Toulouse is really weird. He's short--kindergarten short--dresses in a suit like a grandpa, has huge eyes, and barely says a word. But Woodrow isn't exactly Mr. Popularity. The frequent target of the class bully himself, he figures that maybe all Toulouse needs is a chance. And when the two are put together in gym to play volleyball, they make quite the team. Toulouse can serve, set, and spike like a pro. He really knows how to fly around the court. But when the attention and teasing switch back to Woodrow, he learns that the new kid is great at something else: being a friend. 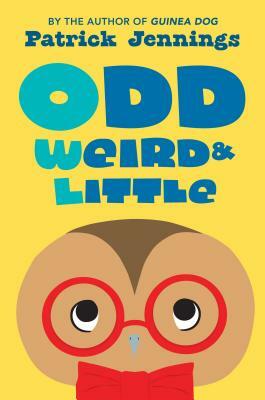 Full of heart and laughs, Odd, Weird, and Little is another winner from the author of the Guinea Dog series. Patrick Jennings blasted onto the children's book scene with his critically acclaimed"Faith and the Electric Dogs," which received numerous starred reviews and is now in film development. Known for his wide range of topics and styles, he has turned his focus to writing silly accessible stories that will appeal to middle-schoolers, including his recent Egmont releases"Guinea Dog"and its sequel, "Guinea Dog 2," "Lucky Cap," "Invasion of the Dognappers," and"My Homework Ate My Homework." A former resident of Bisbee, Arizona, Jennings now lives in Washington State. You can visit him at www.patrickjennings.com."